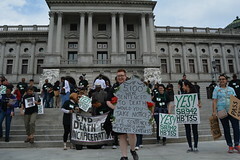 On April 7th this year a small crowd gathered in the Rotunda of the Harrisburg State Capitol to protest recent deaths in Pennsylvania prisons. 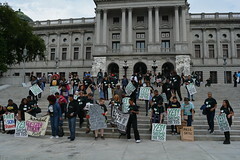 Most of the demonstrators, who presented a list of demands to law makers were family or friends of the deceased. 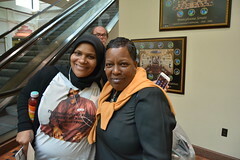 Some prison advocates and activists were also present from the Fight for Lifers West, STOPMAX Campaign, Prison Society, New Vision Organization, defenestrator and Friends and Family of Prisoners Emergency Response Network. With one of the key organizers stuck in traffic, the protest self organized and relatives of the deceased spoke on the loss of their loved ones. 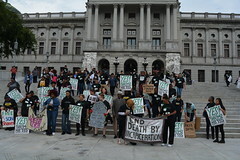 According to the Pennsylvania Department of Corrections (PA DOC) nine prisoners committed suicide in PA prisons in 2007. That conditions of prison life have led many inmates to suicide is relatively common knowledge, but relatives of the prisoners immediately sensed something was wrong. Of the nine so-called “suicides,” three took place at SCI Smithfield in Huntington, PA. All of them happened to take place in the prison’s dreaded RHU or Restricted Housing Unit, commonly known as “the hole”, where prisoners are sent to solitary confinement as punishment. Prisoners regularly suffer severe mental breakdowns while in the hole, and cases of food tampering, increased general restrictions and beatings have made the experience even more severe for many. Relatives of the deceased pulled together and compared notes. All three, it turned out had communicated to their people warning them that Correctional Officers were out for their lives and not to believe any stories of suicides, if they were to suddenly turn up dead. 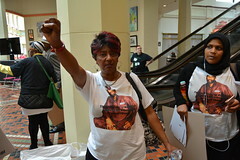 Finney had already completed his full sentence years ago, but was hit with new charges by guards just before his release, resulting in several extra years of incarceration, numerous beat-downs and stints in the hole. 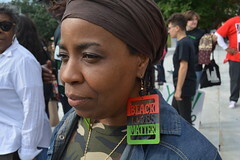 “Even after his death, they wanted to charge him with another one,” said his mother, Carolyn Finney. “We’re trying to push for an independent investigation into these deaths . We’ve been trying to contact our local representative to no avail. No one is helping us and we need help. 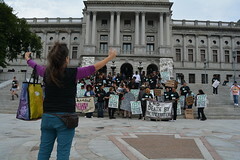 Not just for Joe Kapa, not just for Joe Holguin and not just for Clifford Finney, but also for the inmates that are still being abused in those prisons, “ said Zheng. Zheng is frustrated with a complete lack of response or even interest in the deaths by politicians who she says treated her as if she were a criminal. 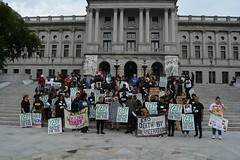 The small coalition demands the establishment of an independent oversight committee with full prison access, adherence of the PA DOC to the Geneva Convention, limiting the use of isolation strictly for prisoners’ safety and independent, unmonitored tip lines accessible to all prisoners so they can report abuses. 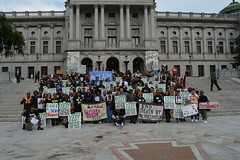 Though small, the spirit in Harrisburg was hopeful and combative, an inspiring example in a growing network of small grassroots prison support groups, many of which consist of little more than a few relatives enraged at the treatment of their loved one. With this years STOPMAX organizing conference about solitary confinement and torture in US prisons in Philly this May and the prison abolitionist Critical Resistance conference in Oakland, CA coming up in September, let’s hope we can reconsolidate, strategize and seriously raise hell against the living hell too many of our people know as prisons.